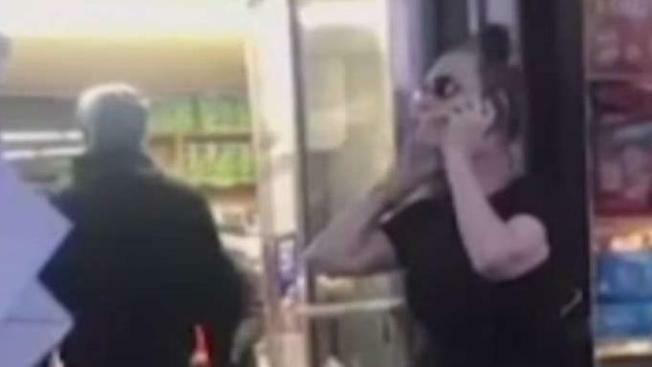 The Brooklyn borough president has asked the NYPD to investigate a woman dubbed "Cornerstore Caroline," who called 911 and wrongly accused a child of groping her. Eric Adams said he requested that police investigate whether Teresa Klein broke the law by impersonating a police officer. When confronted about calling 911 on a child, Klein claimed to be a cop. On Friday, Klein and others watched surveillance video from the bodega, which showed the child's backpack may have brushed against her as he passed with his mother and young sister. Adams said the community was "rightfully outraged" and "we cannot dismiss false complaint calls to the police with mere apologies, sincere or not." He called the viral accusation and aftermath a "modern-day Emmett Till moment," referring to a black 14-year-old boy who was lynched in 1955 after being accused of whistling at a white woman in a grocery store. That killing was a key event leading to the beginning of the Civil Rights movement. Adams said he would hold a "community conversation on diversity and respect" on Monday at 5:30 p.m. at Flatbush and Albermarle. Klein was buying cat litter inside Sahari Deli Market in Flatbush on Wednesday when the boy, wearing a school uniform and backpack, walked past her with his mother and younger sister, witnesses say and video shows. His backpack appeared to brush against Klein's backside. Joni Torian, a customer who witnessed the dispute, told the Post, "The mother was right behind him when she says he grabbed her very flat behind. Ain't no mama gonna let her child sexually assault a woman. [Klein] started yelling, 'Miss, you need to watch your son, he just grabbed my a--.' It was kind of funny at first, but then she was saying, 'I will call the cops.'" Another passerby shouts at Klein, "Who would want to touch your flat a--? Nobody want to touch your flat a--!" She tells the 911 operator that she'll be going home to meet officers to file a report and after she hangs up, she waves at the man filming and tells him, "Now why don't you upload that to World Star?"